Alternative high school credential programs provide individuals who did not complete a regular high school program of study the opportunity to earn the equivalent of a high school diploma. This indicator presents data from the General Educational Development (GED) tests, the High School Equivalency Test (HiSET), and the Test Assessing Secondary Completion (TASC), which are test-based options for obtaining an alternative high school credential. Data presented in this indicator from the GED, HiSET, and TASC are not comparable because of differences in data availability, content coverage, and state policies. This report presents estimates from the 2013 GED administration, the latest year for which data are available, and the 2015 HiSET and TASC administrations. The GED test, developed by the GED Testing Service (GEDTS),1 is an alternative credential test for individuals who did not receive a high school diploma. It was first released in 1942. The 2013 GED (reported in this indicator) included a battery of tests in five content areas: reading, writing, mathematics, science, and social studies. To pass the GED, individuals were required to complete all five tests in the battery and meet the minimum passing standard and all other jurisdictional requirements. In 2013, the GED was offered in the 50 states, the District of Columbia, and some U.S. territories and associated states. Eligibility requirements to take the GED varied by state and jurisdiction. In 2013, some 816,000 individuals in the United States ages 16 or older were GED test takers. About 714,000 of the test takers (87 percent) completed the entire GED battery of five content area tests by the end of 2013 (table 7.1). Of the individuals who completed the entire battery of tests, 541,000 (76 percent) passed2 the entire battery (figure 7.1 and table 7.1). NOTE: In 2013, test takers passed the GED test in most U.S. states by earning an average standard score of 450 or higher in the five individual content areas (equivalent to a standard score total of 2,250 or higher) and earning a minimum standard score of 410 in each individual content area. SOURCE: American Council on Education, General Educational Development Testing Service, 2013 Annual Statistical Report on the GED Test. See table 7.1. In 2013, GED pass rates ranged from 59 percent in New York to 98 percent in Iowa (figure 7.1). In all, 34 states had pass rates equal to or higher than the overall pass rate (76 percent), and 16 states and the District of Columbia had pass rates lower than the overall pass rate. 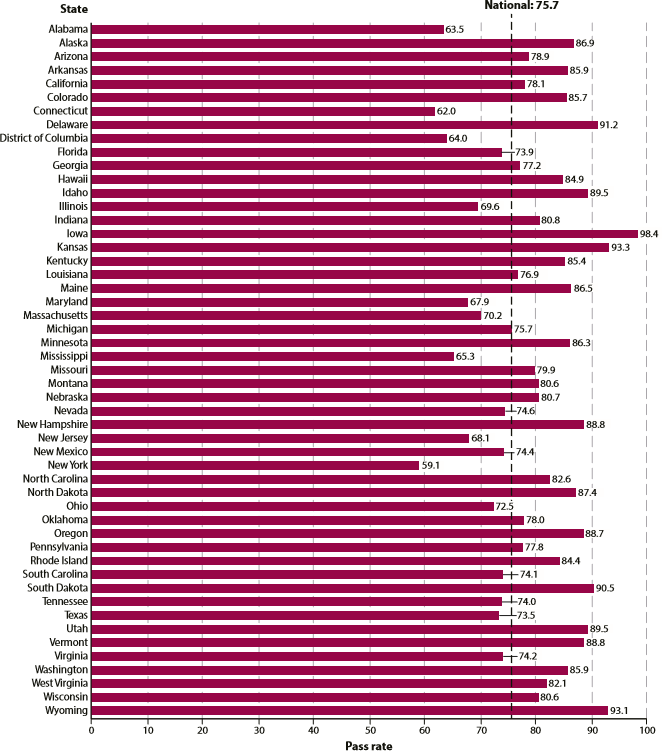 Five states had pass rates above 90 percent (South Dakota, Delaware, Wyoming, Kansas, and Iowa). In 2015, about 62,000 individuals ages 16 or older completed at least one content area test, and 47,000 (77 percent) of the individuals who completed at least one content area test completed the entire HiSET battery of five tests (table 7.1). Of the individuals completing the entire battery of tests, 27,000 (58 percent) passed the entire battery (figure 7.2 and table 7.1). NOTE: In 2015, the HiSET was used in 16 states and a select number of U.S. territories and associated states. Test takers who tested in all five content areas of the HiSET and completed the final test in their battery in 2015 are considered HiSET completers, regardless of whether they met the HiSET passing standard. Those who took some of the tests in the HiSET battery in 2014 are considered 2015 completers if they took the last test in the battery in 2015. A completer must meet the minimum passing standard for the HiSET in order to be considered a HiSET passer. Some jurisdictions require examinees to fulfill additional requirements beyond passing the HiSET in order to receive an alternative high school credential. SOURCE: Educational Testing Service, 2015 Annual Statistical Report on the HiSET Exam. See table 7.1. In 2015, HiSET pass rates ranged from 44 percent in New Jersey to 81 percent in Iowa (figure 7.2). 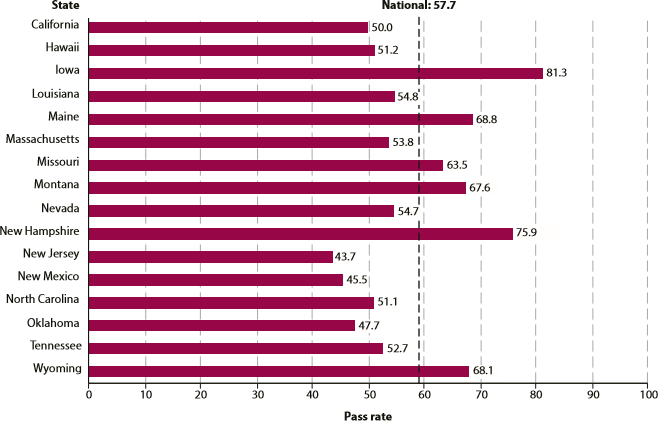 In all, 6 states had pass rates higher than the overall pass rate of 58 percent (Missouri, Montana, Wyoming, Maine, New Hampshire, and Iowa), 10 states had pass rates lower than the overall pass rate (New Jersey, New Mexico, Oklahoma, California, North Carolina, Hawaii, Tennessee, Massachusetts, Nevada, and Louisiana). In 2015, TASC was offered in five states, where a total of 50,000 individuals ages 16 or older completed at least one content area and 44,000 (88 percent) completed the entire test. Of the individuals who completed the entire battery of tests, 26,000 (60 percent) passed the entire battery (figure 7.3 and table 7.1). 1 In New Jersey, New York, and West Virginia, TASC test takers who already had a passing GED score in a given content area were not required to take the same content area of the TASC test (New Jersey also allows a combination of HiSET, TASC, and GED scores). Because the content on TASC is based exclusively on TASC data, students who passed any GED or HiSET content area test in combination with TASC content area tests are not included in the calculation of TASC test passing rates. NOTE: In 2015, TASC was used in five states. Test takers who tested in all five content areas of the TASC and completed the final test in their battery in 2015 are considered TASC completers, regardless of whether they met the TASC passing standard. Those who took some of the tests in the TASC battery in 2014 are considered 2015 completers if they took the last test in the battery in 2015. A completer must meet the minimum passing standard and all other jurisdictional requirements to be considered as a TASC passer. SOURCE: Data Recognition Corporation, TASC Test 2015 Annual Statistical Report. See table 7.1. In 2015, New Jersey (63 percent), Indiana (75 percent), and West Virginia (77 percent) had pass rates higher than the overall pass rate of 60 percent (table 7.1). New York (52 percent) and Nevada (55 percent) had pass rates below the overall pass rate. 1 Although GEDTS designs and administers the GED test, states and sometimes jurisdictions within states set many GED-related policies, such as who can take the test, how much preparation is required, how and when the test can be retaken, how much the test costs, and the official name of the resulting credential (see http://www.gedtestingservice.com/testers/2014policypages for details). In addition, in some states GED test passers must meet additional state requirements (e.g., complete an approved course in civics or government) to receive a high school equivalency credential. 2 In 2013, test takers passed the GED test in most U.S. states by earning an average standard score of 450 or higher in the five individual content areas (equivalent to a standard score total of 2,250 or higher) and earning a minimum standard score of 410 in each individual content area. 3 Test takers who tested in all five content areas of the HiSET and completed the final test in their battery in 2015 are considered HiSET completers, regardless of whether they met the HiSET passing standard. Those who took some of the tests in the HiSET battery in 2014 are considered 2015 completers if they took the last test in the battery in 2015. A completer must meet the minimum passing standard for the HiSET to be considered a HiSET passer. Some jurisdictions require test takers to fulfill additional requirements beyond passing the HiSET in order to receive a passing high school completion test credential. 4 Some states allow individuals under 16 years of age to take the HiSET. For the purpose of this indicator, only individuals age 16 years or older were included in the analysis. 5 The total pass rates for the HiSET and TASC should be interpreted with caution. The pass rate calculations for the HiSET and TASC are based on data from less than half of the 50 states. 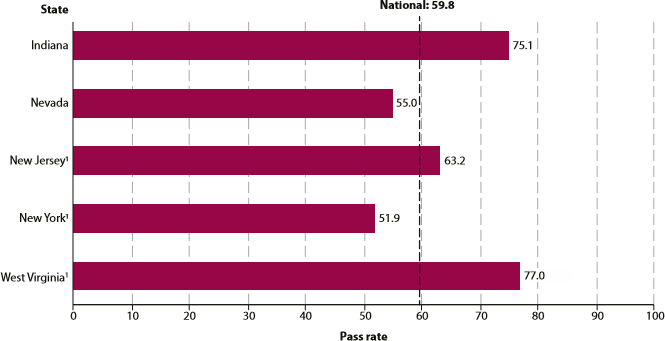 In contrast, GED pass rates were available for all 50 states and the District of Columbia in 2013. 6 New Jersey also allows a combination of HiSET, TASC, and GED scores. Number of individuals age 16 or older who completed and passed all five tests on the GED, TASC, or HiSET battery. Individuals age 16 years or older. Completed and passed all five tests in one of the GED, HiSET, or TASC batteries.